One Week was Buster Keaton’s first starring vehicle—a 19-minute short that kicked off a decade of artistic achievement matched by few people afterward, including Buster Keaton. To me, it’s like a commercial for him. Herein you’ll find a set of gags that run the gamut of Keaton’s skills and preoccupations, from the very big, spectacular and dangerous to the small, subtle and satirical. He loved both. Moreover, he was still learning how to do them well, so in One Week, you’ll also see an artist perfecting his craft. The seeds of great films like The General (1927) can be found in One Week; that alone would be enough to recommend it. Fortunately, it’s a funny, well-paced gem in its own right. The story is basic. 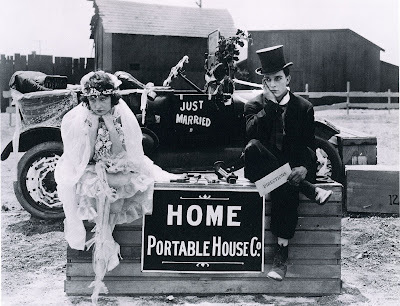 Buster and his newlywed bride (Sybil Seely) have been given a house as a wedding present by Buster’s Uncle Mike. This isn’t as generous as it sounds, since the house is a DIY project in the most literal sense. When Buster and Sybil arrive at the lot, all they find is a set of numbered boxes. The pieces of the house are inside. This house, which will be mis-assembled to comic effect, establishes two elements destined to appear again and again in Keaton’s work. The first is the presence of a large ‘thing,’ before which Keaton is dwarfed and toward which Keaton must adapt his behaviour. Here it’s a building; in later films, it will be a train, a submarine, a waterwheel, or even consequences of nature, like a hurricane. Whatever form it takes, the thing is always passive in the execution of its power (even a violent storm is, in a sense, just being itself). 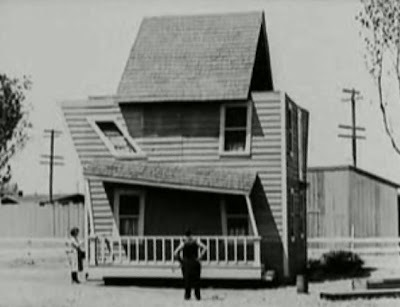 Buster and Sybil’s two-storey house leans painfully to one side. It leaks, too, and its walls give way to the slightest force. When a windstorm arrives, the house begins rotating like a top, flinging its guests out the door and into the mud. However, being an inanimate object, it has no intent to dominate or harm; the source of both folly and cruelty in Keaton’s universe is people. Accordingly, the house looks like it does because a jealous man named Hank, whom Sybil spurned to marry Buster, secretly altered the numbers on the boxes. Like the succession of bullies and harpy-ish women who will prod Buster in future films, Hank’s own character flaws are the root cause of Buster’s conflicts with the world. Aside from a couple of sequences, the success of the house (and by extension, the happiness of his wife) is Buster’s sole occupation, and the sole focus of One Week. This, too, is trademark Keaton—beginning with a scenario and letting the jokes flow from it, rather than painting pre-developed gags over top. Nevertheless, while Keaton’s hapless husband is trying to be like everyone else, the young comic himself is out to prove his star-powered chops; lest we think there’s anything Keaton can’t do, he’ll prove us wrong right here. How else to explain the initial sequence in One Week, in which Buster and Sybil, having just left the church, employ the still-hopeful Hank as their driver? Buster, weary of Hank’s leering backward glances every time he tries to kiss his new wife, decides they should switch cars—and tries to do so by climbing into another car passing them at high speed. It’s a memorable and a dangerous-looking stunt, but it has nothing to do with what follows. Its only purpose is to show what Keaton can do, or at least, what we can expect from a Keaton Film. Tacking on a scene this way is the sort of compromise Keaton wouldn’t make later. And indeed, One Week has other flaws; or, to put it more charitably, signs of inexperience. For example, there’s Buster’s attempt to lift a piano to the second floor with a rope, using his chandelier as a pulley. The tension on the rope is now so great that it pulls the ceiling downward, making it look like a pinched balloon. This is all wrong. The ceiling might be brittle, but it’s not made of rubber. And while I’m no engineer, I don’t think pulling the rope would increase the tension above it. Since Buster is a weakling, and weighs less than the piano does, why would he even be able to budge the thing? The visual of the sagging ceiling is somewhat funny, but the impossibility of it takes us out of the moment. Bad physics leads to another misfire outside. Hank’s head gets stuck in the roof (that is, with his body still inside the house), and Buster tries to free him by lodging a stick under his chin from the outside and prying him out. This is not only impossible, but much more work than simply pushing Hank’s head back through the hole. Buster ends up doing that anyway, but why try something so improbable, first? Future Keaton characters would make mistakes due to naïveté, not stupidity. Oh well. One Week remains, for its flaws, one of my favourite Keaton shorts—brisk, charming and legitimately funny. And while his later films like The Playhouse (1921) would elevate slapstick shorts to a higher art, this one will always carry the intrigue of being first. ***Before someone points it out; yes, Keaton filmed The High Sign before One Week. However, Keaton considered The High Sign inferior, and elected to release One Week first. For the record, I think he made the right choice. Kino International packages One Week with The High Sign and The Saphead (1920), a feature film in which Keaton played a supporting role. Silent Volume has featured several other Buster Keaton films: The Playhouse; Sherlock Jr.; College; and Spite Marriage.